hd EZ lock Universal HDMI Cable Lock. 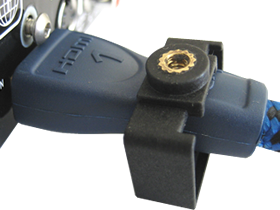 Plug in your HDMI Cable, lock it in place with hd EZ lock and forget it! Installs in minutes, and once installed you can rest assured that you can trust your HDMI connection to just work! NO MORE Lost sound and picture. NO MORE Damaged HDMI Inputs. NO MORE Broken HDMI Cables. 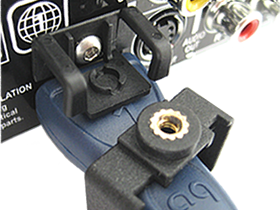 Loosen the existing screw above or below the HDMI Input about 1/8 of an inch. If no screw exists, our provided 3M VHB (very high bond) adhesive works great! 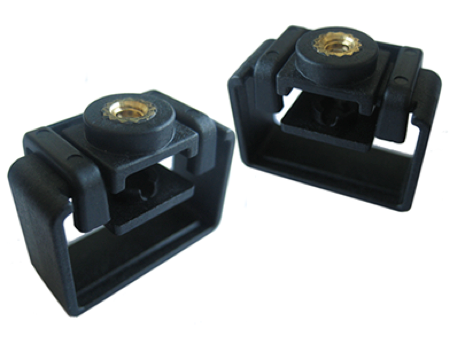 Slide the Mounting Adapter over the existing screw and tighten the screw. Make sure the bottom of the Mounting Adapter is against the top of your HDMI Cable. Slide the Main Body into place. Using the provided 1/16" Hex Key, tighten the Main Body. 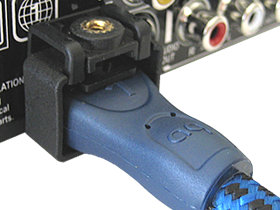 Enjoy the peace-of-mind that comes from knowing your HDMI Cable is now secure!